You are reading page 7 of 5th Nursing Caption Contest - Win $100. If you want to start from the beginning Go to First Page. See, I told you they started using a travel nurse agency! Husband: "Well, I hope they aren't going out in public those scrubs"
gReeNTwin1 is a BSN, RN and works as a Registered Nurse. mrsamjones has 2 years experience and works as a Rn. Now it makes sense why everything they say sounds alien! Gimme your cell phone, Madge, I'm cancelling my LASIK surgery. "Oh, it's re-election time, honey. Those nurses must have been outsourced before Obama was forced to end it". 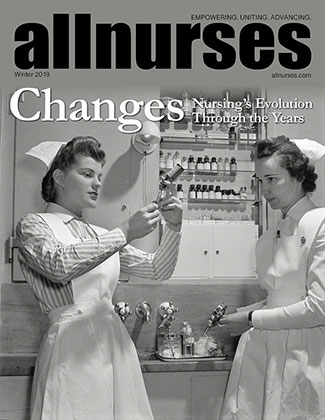 "With increasing union dues, nurses can no longer afford pants." lbaldrige has 21 years experience. I KNEW nurses were aliens. With that language they speak, working long hours, juggling difficult patient assignments, and still able to provide TLC, there was NO WAY they were human. Vanillanut has 6+ years experience. "Nursing: If others knew what we did, they'd see us differently..."
blondiestime2 works as a Business owner and RN 2 B.
Wow, they will let just about anybody into the nursing field these days! I didnt know that planet Nimron was a compact planet? !